Recently I have gotten samples from companies that I saw at the Fancy Food Show in January. I've also gotten more interested in gluten-free baking. Two companies had sent me boxes of gluten-free mixes and I saw that both had sent me white and chocolate cake mixes. With so many mixes, I needed to get baking! After all, although I'm interested in trying them, I also don't need to have baked goods/mixes sitting around my house. I've gained enough weight this year. Sigh. So I decided to make my coworkers the taste testers and baked up the white cake mixes from each company to do a side by side comparison. The first company was Something Good from Australia. Their products are distributed by the same company that I got the Damper mix from. Nice thing about their mix was that it came with icing mix and sprinkles included. The second company was good ol Betty Crocker. I had stumbled across their gluten-free website and emailed them to see if they would send me samples. They sent mixes and frosting. I baked both batches on Sunday morning and started with a personal taste test with Poor Girl, Kimberly, who had stopped by. I then took the rest to work for Monday and told my coworkers to halve them and try one of each and give me their opinions. I'll start by telling you how the mixes differed and then we'll get to the actual taste comparison. Something Good's mix is not only gluten-free, it is also dairy, soy, and nut allergen free. This is a significant difference because I'm sure it makes a difference to some of the ingredients in the mix. It required just adding eggs and water to the cake mix. The icing was surely just a package of powdered sugar and they just told you to beat some water and margarine into it to make the icing. I used butter. It is nice that it is a complete package of mix, icing, and decoration. In the pictures, obviously, they have the sprinkles on them. Betty Crocker's mix is only gluten-free. 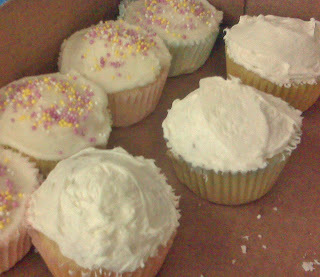 It also made one dozen cupcakes but seemed to be just a bit more batter so that the cupcakes were larger in size. They ask you to mix in water, eggs, butter, and vanilla. This adds a lot to the moisture content and flavor. They had sent me whipped icing as well, but it is sold separately and is not labeled gluten-free. Now I like to bake from scratch and so I use cake mixes only in emergencies or if I doctor them all up. One reason I hate mixes is because they are all air and fluff. Sure they are super moist, but they have no real substance. After all, once you start baking European style and other from-scratch cakes you truly appreciate things like density, texture, and crumb. Here is the Something Good cupcake. These cupcakes were smaller, denser, and drier. They had little flavor. Kimberly and I agreed that while we liked the denser cake, it lacked any flavor. The cake held together well and reminded me texture-wise of some of the specialty cakes I've been baking. The coworkers disliked this one because it was very dry. So maybe these cupcakes should be eaten same day. The Betty Crocker was the favorite from the coworkers. They liked that is was moister and had more flavor. This is easily understandable. This mix had vanilla and butter mixed in. Kimberly and I liked the flavor, but weren't that thrilled by the texture. I felt the texture was more bready and chewy. If we go by majority vote, Betty Crocker wins. But I think it wins on flavor and Something Good wins on texture. You will find Something Good found at the Gluten-free Specialty Store at 2612 J Street.